Wolves go into Friday’s game having won two of their last three games versus Cardiff, including a 1-0 away victory in the Championship in April. Both league encounters in 2017-18 were won by the away side. Wolves have won six of the last 10 fixtures, with Cardiff victorious in the other four encounters. This is their first top-flight meeting since Wolves claimed a 3-2 away triumph in February 1962. Cardiff lost a top-flight encounter 9-1 to Wolves in September 1955; it remains the Bluebirds’ heaviest home league defeat and Wolves’ biggest away league win. Cardiff manager Neil Warnock has hinted he will make changes with three games in eight days looming. Josh Murphy will likely be recalled, while Nathaniel Mendez-Laing, Jazz Richards and Gary Madine are being assessed after recent injuries. Wolves are again without Spaniard Jonny Otto because of a knee injury. Diogo Jota is amongst several players pushing for a recall following last weekend’s 2-0 home defeat by Huddersfield. Connor Wickham has returned to training following a thigh injury but is not yet ready for competitive action. Scott Dann could come back into contention although Christian Benteke remains sidelined with a knee injury. Andros Townsend is expected to partner Wilfried Zaha up front, while Max Meyer should keep his place out on the left. For Burnely, Johann Berg Gudmundsson is available following illness. James Tarkwoski also comes back into contention for Dyche. However, Saturday’s game comes too soon for Stephen Ward who is recovering from a knee injury. Nick Pope remains sidelined with a shoulder injury until mid-December. Ben Gibson is nearing a return but is lacking match fitness. Crystal Palace come into the match without a win in their last eight, although they will be boosted by last weekend’s draw at Old Trafford. The Eagles are one of two sides yet to win a single home match this season. Burnley have won one of their last nine league matches on the road. The hosts will be without defender Chris Lowe, who is still recovering from a shoulder injury that he suffered in the Terriers’ game against West Ham at the start of November. Dutch full-back Terence Kongolo is facing a race to be fit for Saturday’s game, whilst striker Laurent Depoitre might also miss out due to a groin injury. Danish international Mathias Jorgensen could make his return to the starting eleven after being rested last week by Wagner. Brighton will still be without record signing Alireza Jahanbakhsh, who hasn’t featured for the Seagulls since picking up an injury against Everton three weeks ago. Hughton will also be without midfielder Dale Stephens, who is serving the second game of his three match suspension for the red card he picked up against Cardiff City. Huddersfield and Brighton both achieved promotion to the Premier League in 2017 and played each other twice last season. The Terriers won 2-0 at the John Smith’s Stadium courtesy of a brace from striker Steve Mounie, whilst the return fixture at the Amex ended all square in April. In the overall head to head stakes, Brighton have won 22 times whilst Huddersfield have prevailed on 18 occasions, with 16 matches ending in a draw. Leicester have enjoyed recent success in this fixture, particularly since both teams returned to the top flight. The Foxes have won all four of their home games against Watford in the Premier League, scoring eight goals in the process. Watford’s last win at the King Power came in the Championship back in 2013, but you’d have to go back another nine years to find their next success. Leicester have James Maddison available for selection, after the midfielder served his one-match ban during the Foxes’ dramatic EFL Cup penalty shootout win over Southampton in midweek. The England youngster was sent off last weekend against Brighton after receiving two yellow cards (one for simulation), but he is likely to slot straight back into the side given his impressive form this season. International teammate Harry Maguire remains a doubt following a recent knee injury, but Daniel Amartey (ankle) is definitely ruled out after undergoing surgery. Watford are still without injured trio Daryl Janmaat, Jose Holebas and Tom Cleverley, although the Hornets hope to have all three back in early December. Javi Gracia may opt to name the same side that went down to Liverpool last weekend, given their strong start to the season. Isaac Success and Andre Gray are both pushing for starting berths up front, but Troy Deeney is likely to lead the line once more. Ilkay Gundogan, Gabriel Jesus and Bernardo Silva could all return for City, but Benjamin Mendy and Kevin De Bruyne are sidelined.​ Mendy’s absence could mean another start for Leroy Sane, who scored twice against West Ham last weekend. Adam Smith is facing a prolonged spell on the sidelines for Bournemouth through injury, while Jefferson Lerma will miss out as he serves a one-match ban. 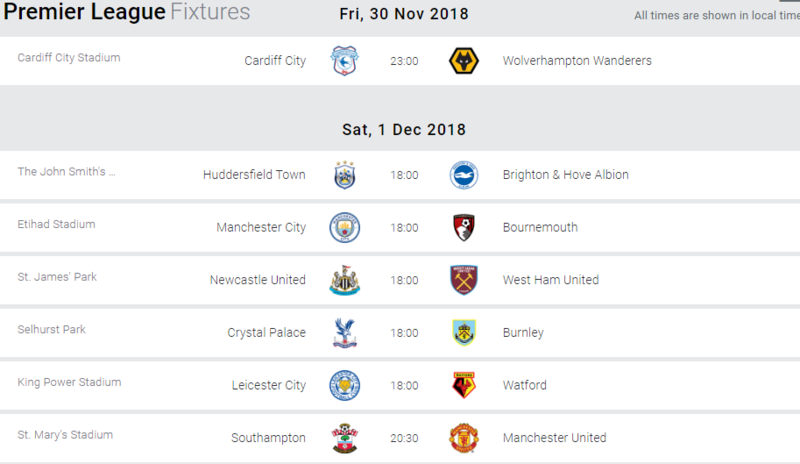 Saturday’s game will represent the 13th competitive meeting between the two clubs, with City registering 10 victories and Bournemouth yet to record a single win. The two draws came in 1989 and 1999 – when the teams were competing in the old Division Two – with City winning each of the six contests in the Premier League. As many as 21 goals have been scored during those half-a-dozen matches, with Bournemouth finding the back of the net on just two occasions. Jamaal Lascelles and Jonjoe Shelvey both returned to training for Newcastle this week ahead of the game. The former had been struggling with a shoulder injury while Shelvey has been needing to build up fitness of late. Meanwhile, striker Mutõ who has been struggling with a calf injury, was also pictured in training. Finally, Karl Darlow also trained after an elbow injury. All eyes will no doubt be on Marko Arnautovic’s fitness ahead of this game. The Austrian hobbled out of the game against Manchester City despite West Ham having already made all three substitutions. Andy Carroll returned to the squad in the game against Man City but was an unused substitute. Jack Wilshere is also said to be closing in on his return from injury and could do this weekend. It’s been an incredible month for Newcastle. Before November it really looked as though Rafa Benitez’s side would be one of the favourites for relegation. Part of that was bad luck, part of that was poor performances as Newcastle went winless in 10. In those 10 came close run games against Tottenham, Arsenal, Chelsea, Manchester City and Manchester United. In stark contrast to Newcastle’s recent form, Manuel Pellegrini’s side are struggling. The Hammers have only one win in the Premier League since the famous win over Manchester United at the back end of September. While many expected them to push on after that big win against Jose Mourinho’s men, they lost 1-0 to Brighton. That was followed up by a 1-0 loss to Tottenham. A respectable 1-1 draw with Leicester followed at the King Power before West Ham finally got back to winning ways with 4-2 win over Burnley. However, that didn’t last long, a 1-1 draw with relegation battling Huddersfield followed before a 4-0 thrashing at the hands of Manchester City. Victor Lindelof faces around a month on the sidelines after picking up a thigh injury against Crystal Palace last weekend. Alexis Sanchez picked up a hamstring injury in training on Thursday and is a doubt for this match, although he was an unlikely starter anyway after being left out of the squad entirely for the midweek win over Young Boys. For Southampton, Danny Ings faces a late fitness test as he looks to shake off a hamstring injury, while Sam Gallagher and Shane Long both remain injured. Ryan Bertrand may also miss out due to a back problem. United are unbeaten in their last five meetings with Southampton across all competitions, but there has been just one goal in the last three league editions of this fixture – a Lukaku winner at St Mary’s last season. The Saints have managed two wins in their last eight meetings with United – as many as in their previous 22 before that – but both of those victories came at Old Trafford. Southampton have not won at home to United since a 1-0 victory in August 2003, when James Beattie scored the only goal of the game in the 88th minute. Chelsea’s Eden Hazard will face a late fitness test after twisting his ankle in last weekend’s defeat to Tottenham, while Ethan Ampadu has returned to full training following his own injury lay-off. For the visitors, Andre-Frank Zambo Anguissa and Kevin McDonald are both unlikely to be fit, although Joe Bryan ended his seven-week injury absence by returning to the bench against Southampton last time out. The Blues are on a 3 match win streak against Fulham across all venues. Fulham previously won this fixture long back in 2006. Chelsea have never lost a home game against this opposition. With that defeats to Spurs Chelsea fell to 4th position in the table. After 13 matches, they have 28 points and are 7 points behind the leaders-City. They have 8 wins in that run and have scored 28 goals too. Fulham are already in the relegation zone after 13 rounds are completed. They conceded 33 goals from their league games so far, which makes them the worst defensive unit in the competition. The Cottagers will have to find something magical to beat the Blues this Sunday. Arsenal have the chance to move level with Tottenham when the sides meet at the Emirates Stadium in Sunday’s North London derby. The Gunners have finished behind their neighbours in both of the last two seasons, but are currently keeping up the pace after a run of 11 league fixtures without defeat. Tottenham welcomed back Danny Rose to the match-day squad for Wednesday’s impressive win over Inter Milan. Spurs kept alive their Champions League hopes with a narrow victory over the Serie A club, a game which also marked Jan Vertonghen’s return to the senior team after six weeks on the sidelines. Rose was an unused substitute, but will hope to play a part in Sunday’s north London derby against Arsenal, while Kieran Trippier is also pushing for a return. Elsewhere, Mousa Dembele, Davinson Sanchez and Victor Wanyama remain out with longer-term injury problems. Arsenal will hope to have Alexandre Lacazette and Laurent Koscielny available when they host Tottenham in the north London derby on Sunday. Koscielny is pushing for a start after recovering from an Achilles injury he sustained back in May. The Frenchman played for Arsenal’s Under-23s earlier this week and earlier in November, Unai Emery offered positive news regarding the Frenchman’s return. Lacazette missed Sunday’s win over Bournemouth but is expected to return for the visit of Spurs, while Nacho Monreal, Konstantinos Mavropanos and Danny Welbeck remain sidelined. Welbeck faces a lengthy spell out, but Mavropanos and Monreal are expected back in December. Tottenham will come into the North London Derby off the back of winning seven of their last eight league games, and now sit in the top four of the Premier League table. It has been Spurs best start to a Premier League season. The Premier League have confirmed that Mike Dean will be in charge of the fixture and it was this match last season, that Dean was criticised by Mauricio Pochettino for allowing Shokdran Mustafi’s offside goal to count. Many Arsenal supporters believe the referee has a Tottenham bias and this could mean the weekend’s match could become an even more boisterous fixture than usual adding to the traditional fiery atmosphere. Last season, each side won their home fixture whilst keeping a clean sheet. Liverpool hopes of qualifying for the Champions League knockout stages were handed a major blow in midweek as they lost away to PSG, and while their fate does still rest in their own hands it does mean they now need to beat Napoli by 2 or more goals in matchday 6 of the competition. Their away form in the Champions League has been dreadful this season, but fortunately their troubles don’t follow them back into domestic competition. They are still unbeaten in the Premier League, winning 10 of their 13 games and trailing the reigning champions Manchester City by just 2 points. Liverpool’s 3 draws this season have all come against traditional ‘Big Six’ sides in the Premier League too, and their only failure to win at Anfield came against Manchester City. They even managed to keep a clean sheet against a Manchester City side who have scored an average of over 3 goals per game in the league this season, hinting at the strength of their new look back line. Jurgen Klopp really has worked wonders at the back for Liverpool, stabilising them with Virgil van Dijk in January and moulding them into a back 4 capable of shutting the opposition out. They have the joint best defensive record in the top flight, and at Anfield they have conceded just once in six league matches. This isn’t good news for Everton, and their chances of breaking their Merseyside Derby curse are looking slimmer by the minute. They haven’t beaten Liverpool in any of their last 17 league meetings, and their last victory at Anfield was all the way back in 1999. They have lost 3 of their last 4 trips there too, so it’s understandable that the high flying Liverpool are strong favourites on Sunday. The Toffees are by no means in bad form. They have only lost 1 of their last 7 Premier League matches and have won 5 times, but they have lost 2 of their 3 meetings with Big Six opposition and failed to win any of them, and away from home they have only managed 1 league win all season. Considering Liverpool’s fantastic record against Everton, along with the fact that they have kept a clean sheet in 10 of their last 11 home Premier League games, we like the look of Liverpool to Win to Nil here alongside a 2-0 correct score predictions. Jordan Henderson is suspended for Liverpool after his red card last weekend, while Alex Oxlade-Chamberlain and Adam Lallana are both injured. Dominic Solanke and Divock Origi are both doubts as well, although neither were expected to take part anyway. Liverpool have won three and drawn three of their last six meetings with Everton, and they haven’t lost any of their last 17 Merseyside derbies in the league. They haven’t lost at home to Everton since 1999, a run of 21 matches unbeaten.